It was an exciting week for The Beast on the Broch, because the post brought an Advance Reading Copy (ARC) from Cranachan. This was the first time I’ve seen the book in print, complete with cover. 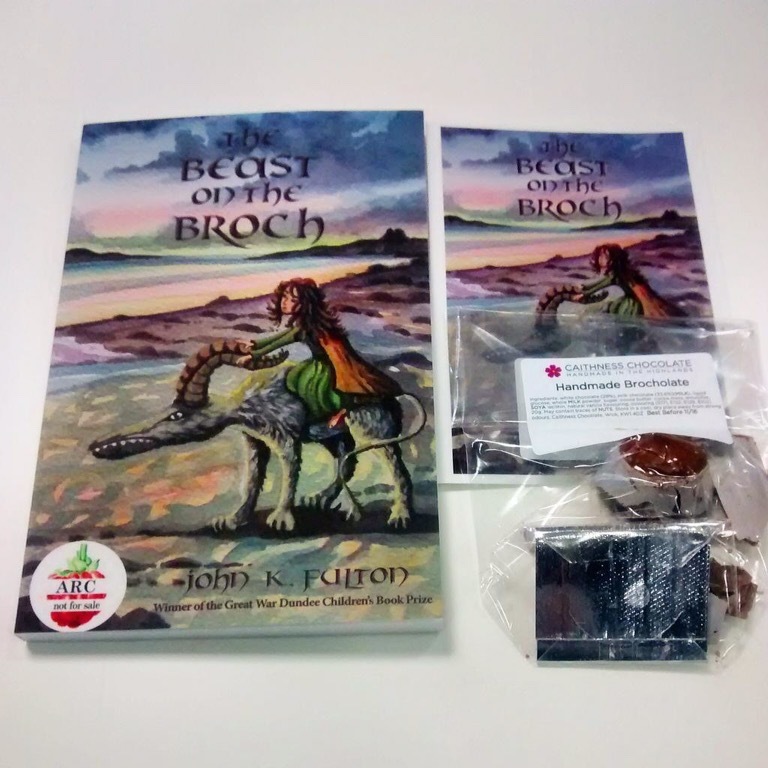 The package was wrapped up in Pictish Beast wrapping paper, and contained a postcard featuring Dawn Treacher’s amazing cover art and a chocolate broch – authentically ruined! Well, the thin chocolate wasn’t likely to survive the journey, but the broch in the story is a ruin, so it couldn’t be more appropriate. It’s not quite the finished product, of course. Despite many rounds of edits in Word and then several reviews of the typeset PDF, coming to the book with reasonably fresh eyes brought a handful of typos and slightly awkward phrases to light. I passed the book to my partner Sandra, too, and she found a few little mistakes. That’s OK, though. It’s called an uncorrected proof for a reason, and we’ve still got the opportunity to make a few tweaks before the actual launch in September. The bloggers and reviewers who received ARCs seem to like the packaging, too – only time will tell whether the story itself pleases them. It’s a bit nerve-wracking, knowing that your book is in the hands of other people. But then, that’s the whole point, isn’t it? There’s nothing wrong in writing for yourself – I do it myself, all the time. I’ve written several short stories that I’ve never sent anywhere. But I want to share the adventure of Talorca and the Beast with people. Sending out ARCs to a handful of people is just the start. Come September, we’ll be unleashing the beast for real.